Sierra Precision Painting has been maintaining our home’s exterior shingles, siding and wood trim since 2004. We have been very pleased with Patrick’s dedication to providing excellent service and complete, finished jobs. He and his team have been easy to work with and offer good suggestions. Since I have worked with contractors in my profession for many years, I feel comfortable saying that strongly recommend Patrick and his company. This is the first time that I’ve used Sierra Precision and I couldn’t be more satisfied. Patrick and his crew were professional, accommodating to my needs, and reliable. I’ll definitely use him again. Patrick started working for us in 2005 while we were building our new home in the Tahoe area. He did all the original painting, inside and out. The exterior of our home is wood shake that has areas that need to be painted/maintained every summer and Patrick takes care of this for us. For over ten years, he has stayed on top of maintaining and taking care of our home with pride and treats it as if it was his own. Patrick and his crew are honest, reliable and do a high-quality professional job. You can depend on them to do what they say they will do and finish the job on time. A special touch that I will always remember is that Patrick made us a catalog file consisting of paint samples with the names of all the paint colors for each room in our new home. My husband and I highly recommend Patrick and Sierra Precision Painting. Patrick and his crew at Sierra Precision are as good as it gets! 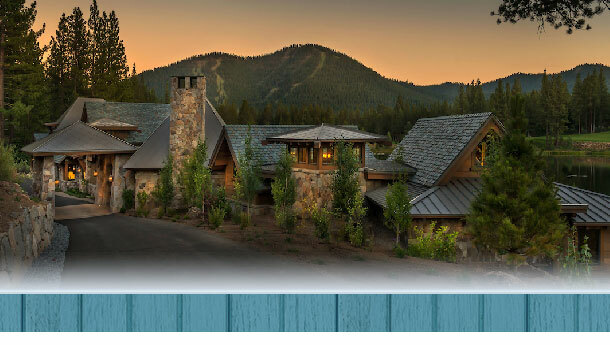 We had them do the exterior stain on our Truckee home and they are very professional and the work was top notch. They showed up on time when they said they would and took great care of the property while on the job. I will definitely use them again in the future! Patrick is reliable, professional and has taken great care of the exterior of our home for years. Our Kings Beach home is a second home, and I’m not available to supervise projects, but this is never a concern with Patrick and his crew. I trust Patrick completely, and highly recommend Sierra Precision Painting. We live in Cambridge Estates in Glenshire and my house was in dire need of a staining. Sierra Precision’s pricing was very competitive but I actually chose them over the others because Patrick was by far the most professional and clearly knew what he was doing. He picked the perfect stain for my house and his crew was on time, never slacked and did an impeccable job. After a year, I still get compliments on how good it looks. I only review companies that deserve a high rating and these guys are the real deal. Patrick is courteous, knowledgeable and delivers a quality service. The weather in Truckee is severe and our houses take a beating. I plan to continue to rely on Patrick for years to come to help keep my home in top shape! I have used Sierra Precision for many, many years. Our cabin in Tahoe Donner is exposed to high winds and extreme weather. I trust Patrick and his crew to maintain the exterior. He has given me solid recommendations on stain and paint products and been extremely professional with the application of the products. They have also done interior painting for us and have always done an excellent job. I highly recommend Patrick and Sierra Precision! We’ve have been working closely with Sierra Precision Painting for 8 years. Patrick is professional, knowledgable and reliable, his team is respectful and they produce excellent work.